When we travel we want to be as comfortable as possible. Our clothing can make or break a trip – we can be left a sweaty mess or cool calm and collected. Here we take a look at what to look for in a great travel shirt and our top 5 choices for the best travel shirts in 2017. There are lots of things to factor in when finding the best travel shirt. With any piece of clothing, but particularly something you will be using to travel in, you want it to be comfortable. Travelling can be tiresome and being comfortable becomes even more important. The best shirt will be one that is resistant to stains and wrinkles. If it is resistant to stains you should be able to get much more wear out of it before you have to wash it. Being wrinkle resistant means you have one less thing to worry about when you wash it too. Just as being stain resistant lends to being able to wear an item for longer, so does being odor free. Merino wool is known for its properties for keeping odors at bay and is usually a great choice if you want to wear something for days on end but not worry about smelling! If you are going to be away for a while you want clothing that is quick drying. This means you can take less clothing with you too. You want something that is going to last the test of time. Travel can be tough on your clothes but if you’re going to be wearing the same shirt over and over, you want it to actually last and not fall apart after the umpteenth time of being worn/washed. For many people, price will be a consideration. It is all relative though as sometimes an “expensive” shirt may actually be better value money than a cheaper shirt that falls apart or doesn’t do the job you want it to do. You may want to use your shirt for more than one occasion. You might want a day shirt that can look good on a meal out in the evening. Colors and materials can definitely make a shirt more suitable for certain occasions so worth factoring this in if you want to double your shirts abilities. Cotton is breathable and generally nice to wear, making it a great candidate for a good travel shirt. However cotton isn’t quick drying and can hold onto moisture which can make you look like a sweaty mess. This is a problem both in the summer and winter. In the Winter, its ability to hold on to moisture will make you feel cold, and in the summer you’ll just look gross. There is a reason sports clothing is not made out of cotton. I love cotton but as someone who is very active, I don’t wear it often and tend to stray towards sports clothing for travel instead. Cotton can look good both in everyday wear and for wearing out in the evening. Polyester is generally the choice for sports wear due to its ability to wick moisture away from the skin. It is quick drying and can be easy to wash. The only downside is that if you get a poor quality shirt, you will find it holds on the odor. I have plenty of sports tops I have had to throw due to this! So it can be hit and miss for a nice travel shirt too. Polyester isn’t great for dressing up though so isn't the most versatile fabric. Merino wool is one of my favourite materials when it comes to clothing. In the Winter, it is nice putting it on because it isn’t cold. It is a great insulator too so will keep you warm however in the summer merino wool can keep you cool too – although it does have its limits. You may find that you will feel too hot in merino if the temperature is high outside. I like to keep it for cooler weather or mild weather instead. Wool is absorbant but also can feel dry. So if you get sweaty it might hold onto that but you won’t feel it like you would with cotton. Merino wool dries quite quickly which is a bonus too. I found it dries a lot quicker than cooton in the winter and I can usually pull a merino top of the washing line a lot sooner than I could anything else. Lastly merino wool is perfect for an wrinkle free and odor free experience. Wool is anti-bacterial so you won’t find you are stinking out your clothes like other materials. You can also get away with wearing it on consecutive days without worrying about getting smelly either. Merino can also look very smart too. The biggest downside to merino is the cost of it. It can be quite expensive compared to other fabrics. It’s considerable pros though do make it worth the cost. You will also need to look after it and store it properly as moths will eat it if they are hungry! 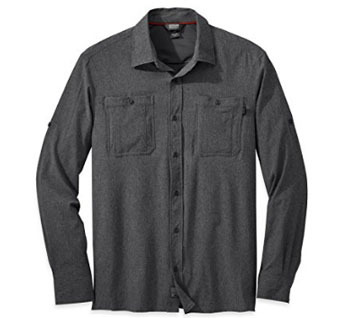 This is a long sleeve shirt that is worn by many professionals including law enforcement and tactical operators. It is designed with this in mind but works perfectly as a travel shirt for this very reason. The shirt is Teflon treated for stain, liquid and soil resistance. It can stand up against the toughest environments so makes it perfect for travelling. 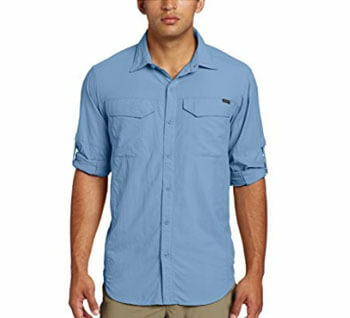 The shirt is made from Taclite poly/cotton ripstop fabric so is very durable. It also is reinforced at stress points too. It has additional features such as a hidden documents pocket at the chest, which is great for carrying money and keys. The shirt also has a Drilex cape-back vent and overall enhanced ventilation for warm climets. 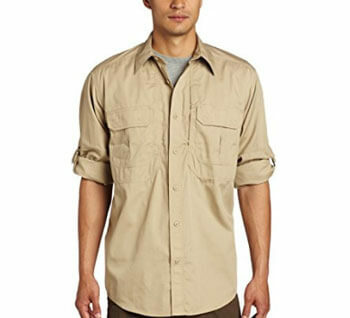 The Outdoor Research Wayward Sentinel Shirt is 86% polyester and 14% elastine. It is breathable, lightweight, moisture wicking and quick drying. It also has movement-mirroring stretch. 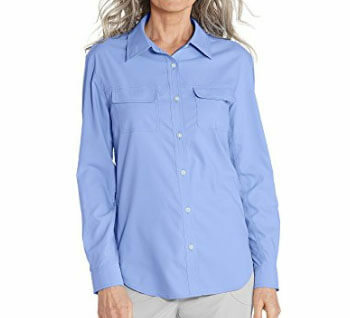 You are also protected from the sun in this shirt as it has a UPF 50+ rating. It also offers insect shield protection so perfect for if you are hiking or off into the wildness. The shirt also has a zippered security chest pocket as well as standard buttoned chest pockets. This is a very versatile shirt and would look good being worn for smart casual occasions too. PROS: Insect and sun protection. CONS: Long sleeved – may prefer short sleeve depending on weather. 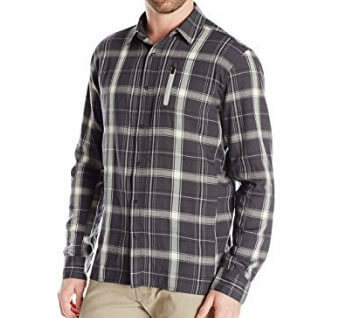 Columbia’s Silver Ridge shirt is a long sleeve top that can be rolled up and kept up with tab keepers if the whether warms up. These tabs are hidden when the sleeves are unrolled which is a nice touch to make the shirt more presentable. It is a relaxed fitting shirt that can look good during the day and for more formal occasions too. The shirt is made from 84% polyester and 14& elastane. It has omni-wick advanced evaporation keeping you cool and dry throughout the day. This includes hidden under arm vents. It also has omni-shade UPF 50 sun protection as well so if need be you can pull your neck collar up to protect your neck from the sun too. PROS: Breathable, wicking and includes sun protection. Good versatility – can be worn for casual and smart casual. CONS: Sizing can be an issue – many customers recommend sizing up. 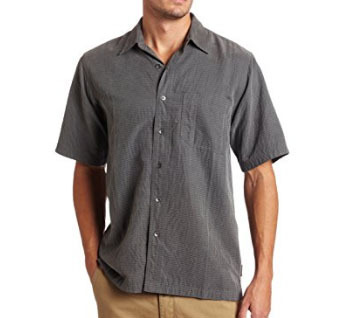 Royal Robbins Desert Pucker shirt has been speficially designed with travel in mind. It is luxuriously soft being made from 80% model and 20% polyester. It is wrinkle resistant and quick drying. It also has some stretch in it too. 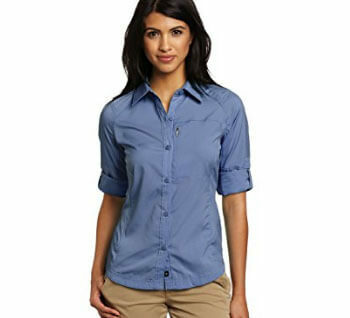 The shirt also offers UPF 40+ sun protection and comes in a variety of different colors to suit your preferences. It has side vents too for easy untucked styling. Royal Robbins also has a recycling program in which you can send your old shirt back once you no longer want it or it is no longer usable. You get the benefit of feeling good about recycling your clothing a coupon for a future shirt. This shirt is lightweight, stylish and easy to wash. The Icebreaker Compass 2 shirt is cool and light to wear. It is made from a blend of merino wool and Tencel fabrics as well as a touch of lycra. This offers the performance of a technical layer but looks smart and functional. The shirt has offset shoulder seams to prevent a backpack from rubbing if you use this shirt to hike. It also has a secured zippered chest pocket for small essential items. It offers all the great qualities of merino wool too – odor resistant, quick drying and wrinkle resistant. This is the perfect day and nighit shirt. PROS: Odor resistant, quick drying and wrinkle resistant. It also keeps you cool and has versatility in use. The Craghoppers Nosilife Olivie shirt comes with permanent insect repellent technology making it perfect for hot climate adventures or when out and about in the wildness. It has a nice feminine fit and is made from 100% polyamide. It is lightweight, wicks away moisture and quick drying. It also has a zippered pocket for carrying essential items securely. CONS: May be more practical than fashionable which might put some people off. 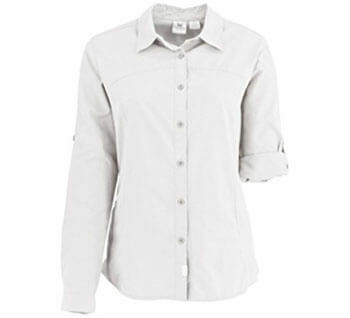 The Coumbia Silver Ridge is a popular shirt among both men and women. It made it into our top choices for men and it wouldn’t be right if it wasn’t in our top choices for women. It has all the same features as the men’s shirt. 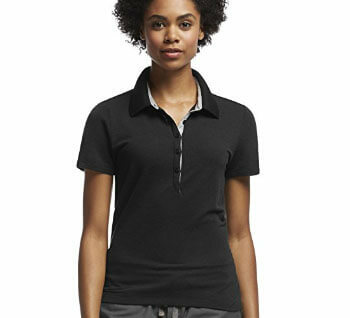 It has omni-wicking to keep you cool, UPF 40 sun protection and a zippered chest pocket for storing small item securely. It is lightweight, breathable and flattering. It dries quickly too so if you need to wash it in a hotel room, it should be dry by the next morning no problem. CONS: Some people found it runs small. The White Sierra Desert shirt offers great protection from the sun with UPF 30 and leaves you feeling cool with its venting system. You can also roll up the sleeves to this shirt easily if it gets a bit hot. The shirt also has a zippered security pocket for valuables and is made from 100% polyester. Polyester is moisture wicking and quick to dry. This is a nice feminine fit which can be easily worn both during the day and a smart casual event. The perfect travel companion. The Coolibar travel shirt is made from polyester with button closures. It has ventilation panels under the arms and along the sides to make this a breathable and comfortable shirt choice. It also offers UPF 50+ sun protection. You can also roll up the sleeves and the chest pockets have Velcro closures for added seucity. 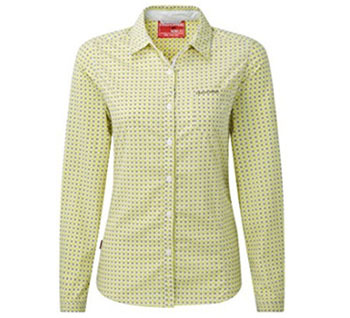 This shirt moisture wicks, is easy to wash, anti-wrinkle and dries relatively quickly. CONS: Expensive for the type of shirt. For something a little bit different we’ve included the Icebreaker Merino polo shirt. Merino is a GREAT fabric to use for versatility and durability. You won’t stink either if you can’t get your top washed for a long period of time. The polo shirt is a traditional polo that has a flattering and casual look. It is quite fitted too. It is 100?% merino wool so offers all its benefits: odor resistant, quick drying, keeps you feeling dry and is soft to the touch. Merino is great in most weathers. PROS: Odor resistant, quick drying and soft to touch. CONS: Expensive and this style may not suit a more formal occasion.